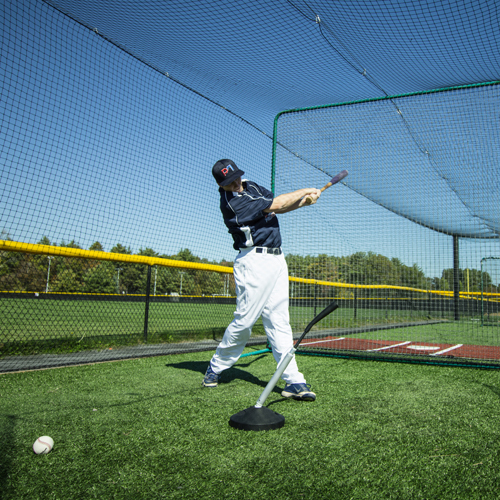 Made from the highest-quality materials, the durable, long-lasting PVTee batting tee is designed to withstand the wear and tear of repetitive use by top players and coaches. The PVTee utilizes a unique magnet to allow the Tee to break down in one second and be put in the equipment bag for travel. It has a weighted base that holds the tee in place, and its flexible pivot joint allows the impact of a mis-hits to be realized in the pivot joint, not the other tee components. The flexible pivot joint also takes the impact away from the batters hands and helps eliminates bat damage. The flexible pivot joint will have the tee back to the upright position before you are ready to put the next ball on. Allows for continuous training by being virtually impossible to tip over.